Sorry, there are only 332 tickets of that type still available. Sorry, there are only 332 tickets left for this event. Includes both days of the conference, all contests, Friday dinner, and Saturday lunch. Attend the Friday Table Topics and Humorous Speech Contests and find out who our District 29 winners will be. This ticket does not include registration for the Saturday conference. Find out who wins the District 29 Evaluation and International Speech Contests! Please arrive no earlier than 1:45 pm. Find out who wins all four District 29 speech contests. For Saturday, please arrive no earlier than 1:45 pm. Sign up here in you're competing in the Table Topics or Humorous Speech Contests on the evening of Friday, May 10. Sign up here if your family member is competing in the Table Topics or Humorous Speech Contests on the evening of Friday, May 10. This ticket does not include registration for the Saturday conference. Sign up here in you're not attending the conference but are competing in the Evaluation and International Speech Contests on Saturday, May 11. Please do not arrive before 1:00 pm. Sign up here in you're not attending the conference but are the family member of a contestant in the Evaluation and International Speech Contests on Saturday, May 11. Please do not arrive before 1:00 pm. Robert Antoinin--"How to Lead People Who Don't Want to Follow"
Who may attend the Conference? Anyone interested in Toastmasters is welcome to attend. People under the age of 18 and accompanied by an adult are invited to attend the speech contests. Where can I find out more about District 29 Toastmasters? There is a large parking lot and a parking garage a short walk from the main door. Parking at the Capital One facility is free. If the parking garage gate is closed, press the intercom button for security and identify yourself as a Toastmasters conference participant. Is there a metro station nearby? Yes, Capital One Headquarters is easily accessible on the Silver Line, a short walk from the McLean Metro Station. Is there a nearby hotel with a room block with a discounted rate for the conference? There is no requirement for what to wear. However, you'll have the opportunity to meet and network with many others so you may want to dress "business casual" or "professional". There will be a buffet luncheon with a variety of delicious food choices. If you have any dietary restrictions, catering staff will be on hand to answer your questions. To pay by check, click here to download a copy of the mail-in registration form. Please make checks payable to "District 29 Toastmasters." I registered for the conference but now I can't come. Can I get a refund? No, but you can transfer your registration to another participant. Contact the conference chair at Conference2019@tmd29.org. Send an e-mail to Conference2019@tmd29.org. 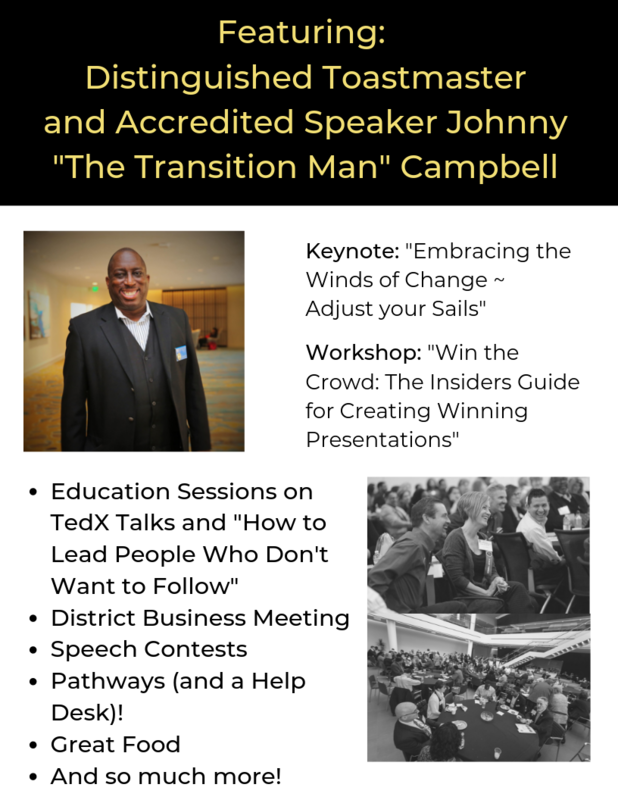 See you at the District 29 Spring Conference! 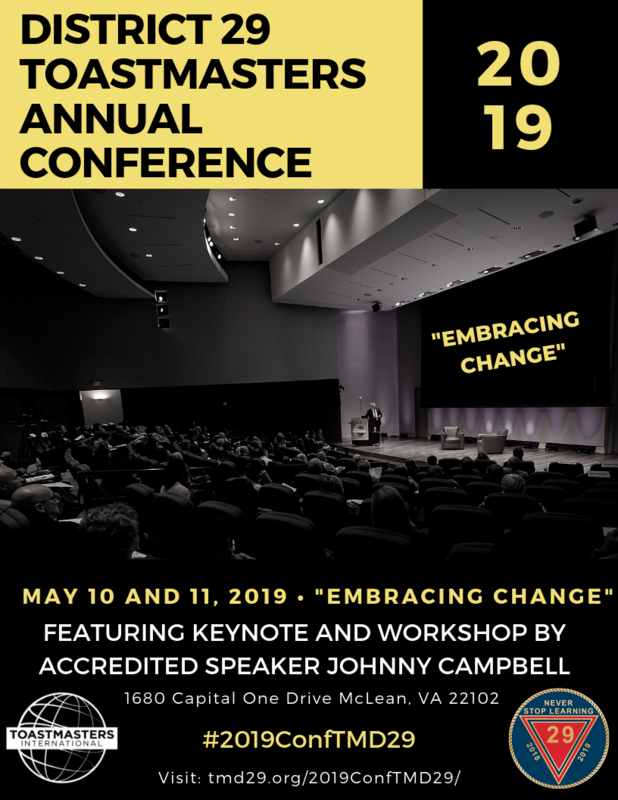 Please note that by registering for the District 29 Spring 2019 Conference, you consent to your image, appearance, likeness, voice, and name being captured in the form of live video, recorded video, and still photography. Any of the images or recordings taken may be used, reproduced, modified, and published in any manner and in any and all media throughout the universe in perpetuity. You also waive any right to inspect or approve any photo, video, or audio recording taken by Toastmasters International or any person or entity authorized by Toastmasters International to do so. If you do not wish to have your photo taken, notify the Conference Chair at Conference2019@tmd29.org.